Today is the day before Thanksgiving. Thanksgiving is a time to be thankful, in everything. We aren’t always thankful for everything, but we are told in 1 Thessalonians 5:18 to “give thanks in all circumstances; for this is the will of God in Christ Jesus for you.” God didn’t suggest we give thanks only when we feel it; He says to give thanks in all circumstances. Sometimes I find it easier to grumble and complain about what I don’t like rather than to give thanks in all circumstances. All. Not just the ones I enjoy or desire, but all. So, in light of our American tradition to focus on thanks this one day of the year I often wonder why Black Friday was designated as the day after thanksgiving. It seems Black Friday, Small Business Saturday, and Cyber Monday, have become their own holiday(s) to squelch all thankfulness right out of us. It is hard to remember I am very content when I see all the really good deals, even though I don’t like to shop (let alone combat shopping) and we’re making our gifts…. Silly me. So, why would I even consider going Black Friday shopping? Because a friend called today and said, “I need a crazy friend to go with me shopping, but this year I’m going at midnight and going all night.” This is the friend who introduced me to Black Friday shopping, standing in line at Toy’s R Us for 2 hours (did that make it 4am, after we drove an hour and a half to get there?) before they even opened at sub-freezing temps…why would I even consider this? Simple. To spend time with a friend. I’m so thankful I have friends. 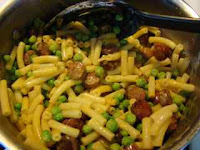 I finally got a $3.69 box of mac-n-cheese, and today was the day we had “macaroni-n-cheese, with hot dogs cut up, and peas”. He wanted to know if I needed the recipe he drew for me. Oh, I love that boy! I was instructed to remember the hot dogs needed to be cut up and cooked first. Then the peas at the end. While I was making lunch he wanted me to play the guessing game to what his most favorite noodles were. So I was asking different foods made with noodles, I suggested mac-n-cheese, he said “no”; I continued asking about shapes of noodles. He finally stopped me and said, “No, none of those. It’s not just macaroni-and-cheese, but your macaroni-and-cheese.” Oh ya – I was fighting tears. I always find it interesting how God knows exactly when and where we need Him to show up most. Today has been a thoughtful, deliberately thankful, not so wonderful day…but even with the gratitude offered for simple “mac-n-cheese, with hot dogs cut up, and peas” in the middle of the day, at the end of the evening, I did have a couple more big blessings. 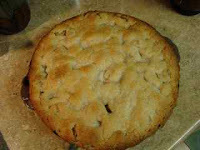 Today I made my very first gluten free apple pie, yes I realize the edges are almost burnt. It is not a pie that could win any kind of beauty contest (but then even with gluten my pies weren’t pretty) This was not a small project, I don’t want to buy the expensive xanthun gum or guar gum on top of which I’ve read too much about people reacting to them so I don’t even want to go there. So, after fixing lunch I got the apples all prepped and went to sprinkle flour on them….ah, crud! I hadn’t mixed up my new batch of gluten free flour so I had to stop and mix that first, for those 3 Tablespoons. I knew I needed to mix a new batch, but I hadn’t done it yet – I was trying to get the apples doing their thing first. I had a moment of being really annoyed and put out that I couldn’t just use regular ingredients and be done. I had to stop myself and be thankful I have so much gluten free available to me. I’m so spoiled, products are so well labeled, I have so many blogs I can research, I have internet to do the research, and there is so much variety in pre-made that I have absolutely no business being grumpy. None at all. Anyway, I got the pie done (finally) and it tastes yummy! The crust doesn’t perform like we think a crust should. It is more of a crumble texture on top and bottom – I’m okay with that, it tastes good :-). Tomorrow my plan is to try my mom’s roll recipe I’ve always used and substitute my gluten free flour to see if I can make rolls….I might chicken out and use the Pamela’s bread mix I bought though. We’ll see how adventuresome I feel. Lastly, tonight as I was waiting for pictures to download from my camera to computer, I was over reading Donna at Funky Junk Interiors blog and when I got to the bottom of her post – there was my picture…. I was so shocked! I won the giveaway to Katies Rose Cottage Designs I posted about on Saturday. I’m going to have such a hard time making decisions – but I can’t wait :-D! Thank you Donna and Lori for this fun opportunity!